You guys. It's August. Where did July go? I was so far behind on my blog reading, but I'm all caught up now. Check it out . . .
Inkophile reviewed an ink I have, but haven't gotten to yet. I like the color! Unroyal Warrant has a CRAZY Field Notes thing going on. 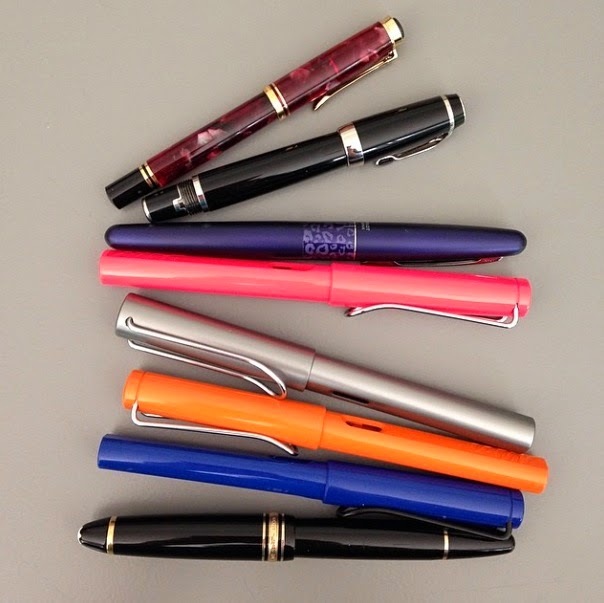 Peninkcillin has a detailed (in a good way) review of the Pilot Metropolitan. Check it out here. Do you read Inklode? I'm gonna start. I've been excited about Kaweco lately. Check this one out from The Pen Cup. That milky color. I loves it. New ink from J Herbin? That's what Inkophile tells us! I won't be at the DC Pen Show - will you? Oh my. A Colorado Pen Show. I love it there. I have good friends there. Hm. And, finally, over on Instagram, I was getting ready to mail out some ink samples . . .
Do tell. Which blogs should I be reading?